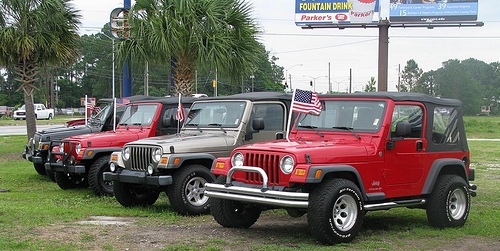 There are many things to consider when preparing to purchase a used Jeep 4X4. Before you make a purchase you should thoroughly research the make that you are primarily interested in. Get familiar with what is standard equipment for the make of Jeep you are considering purchasing so you can differentiate between stock and mods. Once you have narrowed down your choices to the make that interests you, the next step is finding a vehicle that is in good condition. To determine the condition of the vehicle you will want to thoroughly inspect the vehicle for any damage that may have been caused by either off-roading or damage that was sustained in an accident. Not all Jeep 4X4 owners rarely take their vehicles off-roading; many use them primarily as a family vehicle or just driven in cities and on highways. Finding a vehicle like this may seem easy, but once you see one you like, even if the owner assures you that it has never been driven on anything rougher than the highway, you should still take the time to thoroughly inspect the vehicle for damage. The owner may not want to disclose to you that he and his buddies were feeling brave one day and took it off-roading. No matter how nice and honest the owner seems to be, always look out for yourself and inspect any prospective purchases. Some signs to help you recognize a vehicle that has been driven off-road include dented or bent wheels, damage to the under carriage of the vehicle, dents to the body and damage to the suspension. When you’re looking at 4X4’s it is important to get a good look underneath the vehicle so that you can notice any damage that may have gone unnoticed. You will also want to find out if any modifications to the frame or suspension have been made. These modifications can either add to the price or cause it to be lower than the seller is asking. When test driving a Jeep 4X4 you will want to test it on and off-road. This will provide you with a sense of how the vehicle handles in different terrains and if the steering and suspension are in proper working order. You will also want to insure that all aspects of the four wheel drive system work properly, if the vehicle feature locking hubs that must be locked by hand, you will be able to notice if there is any damage to the system when you try to lock the hubs. It is important that you inspect all of the options that are included in the Jeep 4X4 to make sure that they are working properly. There are many great 4X4’s on the market and with these tips you should be able to find one that will make you happy. I am too gullible and I know it. So when I decided to buy another Jeep I took a buddy along with me. When I found the Jeep I wanted, I was ready to pay the guy what he asked for it. Of course, I was assuming that he was telling me the truth. My buddy reminded me that I had brought him along for a reason. He started looking around and asked a few pertinent questions and I soon realized that I had been handed a line of BS. Never assume that you are being told the truth. Don’t be afraid to ask questions and let a mechanic look the vehicle over before you fork over the dough. I never thought about checking standard equipment before but it makes good sense now that you brought it to light. I’ve been looking around for another Jeep. Seems since my boy started driving I have to practically use the ‘Dad Card’ to get time for me. If at all possible you should try to talk the dealer into letting you drive it for the entire day, or at least a few hours. That allows a mechanic time to check things out and still gives you a fair amount of driving time. Of course, if you are buying a brand new Jeep, that’s probably not necessary. I’ve never had that luxury. When I was recently looking at a newer Jeep I thought it looked pretty good but when the mechanic put it on the lift there was another whole chapter I would have missed. The guy never bothered to mention the condition of the under carriage either. Guess that’s why they say ‘buyer beware’. No one wants to point out the problems their used Jeep may have if they are trying to sell it. Duh! You can give it a once over yourself but it’s always better if you let a professional do it. If you have a regular garage that you use, they may do this for you for free. If they do charge, it’s usually only $20 to $30 dollars, at least in my home town. It can save you a bundle in the long run. The answer to that is easy, you look at everything! And some things you look at more than once. You always have at least 2 people check things out in case one misses something. You can’t be too careful. It’s a ‘buyer beware’ world out there and you can’t afford to forget it.